In 1985, sensitive to the needs of players who found traditional wooden flutes difficult and taxing to hold, Casey pioneered preliminary Small-Handed versions of the Pratten flute, and has continued to iteratively improve this design up to the present. Today, the Small-Handed Flute is one special type of Casey Burns Ergonomic Flute. Several customers said that they didn't think they would be able to play the wooden flute because of the hand stretch - that is, until they tried one of Casey's flutes. Casey draws tremendous satisfaction from the gratitude of customers who enjoy playing again, thanks to these comfortable and musical ergonomic flutes. "To me this is one of the most significant differences between my flutes and that of other makers. 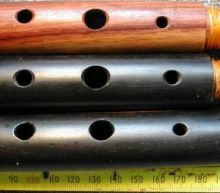 Most traditional Irish flutes, such as the original Prattens or Rudalls are usually copied with their original finger spacing, which I find very uncomfortable and limiting. Think about it - the modern Boehm flute evolved partly to overcome these wide stretches, leaving the unergonomic 8 keyed flute consigned to the dustbin of history. With a modern awareness of ergonomics, Carpal Tunnel Syndrome, Repetitive Strain Injury (RSI), etc., it makes sense to fit the flute to the person rather than the other way around. "A number of my colleagues have finally caught on to the demand for smaller handed flutes. However, there is much more involved than simply moving the fingerholes closer together and making tuning adjustments, as the holes usually have to be smaller. This doesn't work for all flute bores and embouchures. Much of my work in this field over the last 17 years has been to test and understand which combination of flute bore and embouchure and other parameters work well for this type of instrument. "By carefully adjusting the bore and the sizing, placement and undercutting of the fingerholes, I have designed a flute comfortable for most hands. Since rapid finger articulation is so important, the flute should facilitate the playing of Irish music, rather than work against it. My flute is made with this in mind." "A prevailing opinion among some naïve players and makers who should know better insists that the fingers must fit the flute and not the other way around - thus all sorts of harmful finger exercises and wedging the fingers apart with rubber erasers and other forms of mild torture are commonly recommended! It is a falsehood that an Irish flute must be copied strictly from the measurements of the original instruments to play easily and produce an authentic sound! "Originally, it was the unmet demand for smaller handed flutes that inspired the ergonomic flute designs. However, I found that players with normal and even larger sized hands still had difficulties with the original 19th century fingerhole layout. There is no acoustical reason not to move a fingerhole to reach the fingers better. Even modern flute makers have realized this; just a short time ago the prevailing opinion on the open hole flute was that the fingerholes had to be straight in line." In 2003, Casey Burns introduced a new series of flute designs representing the culmination of his years of research and flute-making experience. In many cases, the ergonomic adjustments have led to gains in tonal quality and flexibility, not only maintaining the admirable features of the historical predecessors. These new instruments, including the Ergonomic and Small-Handed models, are remarkable for their firm and co-operative tone, balance across registers, and consistent intonation. Please see the Ergonomic/Small-Handed flute discussion in our FAQ.